Pick up your iPhone and tap the home button twice. If you’re running iOS 4.0 and up then your app switcher should have popped up (unless you did something funky with Activator). Apple’s stock app switcher is a handy shortcut for jumping between apps and playing music, but by default it’s kind of awkward and underwhelming: you have to close apps one at a time, there’s no album artwork – just the icon for whatever app your iPhone is drawing audio from, and the music navigation buttons are on a different panel than the volume control. Switchy is a tweak which changes that. The most obvious change in Switchy is that it makes the app switcher bigger. Not only does it have space for an extra row of tiles, it also brings the page indicator lights to the bar making it two and a half times bigger. Switchy puts all the music controls on one page, and includes a brightness slider as well as a button for clearing apps from the background. Switchy is available in Cydia under the BigBoss repository for $1.00, and warns that it is not compatible with the iPad. There are other apps which offer some of Switchy’s functionality. SBSettings (FREE) has a downloadable toggle called Remove Background, which will end all backgrounding tasks and remove them from th task switcher. Music Control Pro adds an Activator enabled control bar which includes album art, forward/backwards buttons, and volume on the same pane and can be set to activate alongside the app switcher (Music Control Pro costs $5.99, but offers a ridiculous number of other features like video app backgrounding, notification center plugins, and bluetooth control). 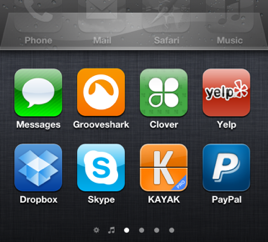 That said, they don’t make use of the app switcher bar itself, like Switchy does. What’s the verdict? Is Switchy the app you’re looking for? Let us know what you think in the comments section below. Combine this with AppClose tweak and you have best task manager/switcher for iphone. Saves lot and lot of presses on home button. Zephyr is also a super addition to this combo. I`m using Switchy + MultiCleaner + Zephyr ! Also an awesome combo! Cheers !